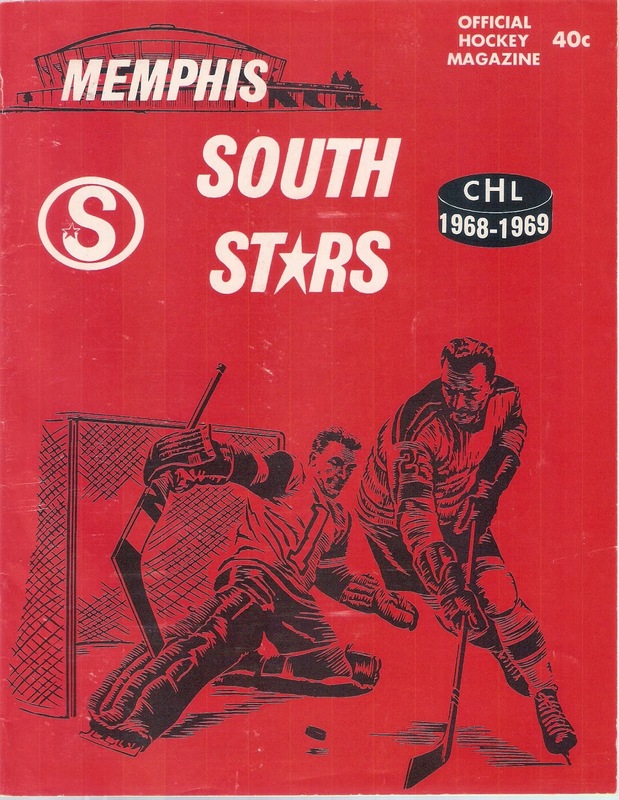 The Memphis South Stars were part of the old Central Hockey League, a nine-team circuit based mostly in the American Southwest. The Stars were affiliated with the Minnesota North Stars and played their home games at the Mid-South Coliseum. They replaced the Memphis Wings, who moved to Fort Worth after the 1966-67 season. John Muckler was behind the bench for both seasons the South Stars existed. In their inaugural season, the South Stars went 24-34-12, good enough for third place in the Northern Division and a first round exit in the playoffs. Memphis drew the second-fewest fans that season, as 2,315 per game went to Mid-South for hockey. 1968-69 was even worse for Muckler and the South Stars. Memphis plunged to the CHL basement, going a woeful 14-41-17. Their meager 45 points were 21 points behind the next-worst team, Fort Worth. The South Stars struggled on both offense and defense. They scored only 208 goals, worst in the league. Doug Senior topped the Stars on offense, with 22 goals and 60 points. Four other players scored 20 or more goals. On defense, the Stars allowed a league-worst 304 goals. Memphis used three different goaltenders that season. Carl Wetzel (39 games) and Fern Rivard (29) were the two main netminders that year, with Gary Bauman making it into six games. Despite the poor record, the South Stars did have some talent. Former Detroit Red Wing Parker MacDonald played in 28 games, with 6 goals and 17 points. Defenseman Lou Nanne went on to a 10-year career with Minnesota, later joining the North Stars front office. And then there was Bill Goldsworthy. Goldsworthy would play over 10 years in the big leagues as well, most of which in Minnesota. Decent-sized program for it's time. This one has 46 pages, mostly black and white, but there are a few color ads. There's even an article about "How to Enjoy Hockey" and women's interest in the sport. This is the only time I've seen a South Stars program, and I grabbed it. Don't think I paid too much for it either. Aftermath: The South Stars' poor performance didn't help matters at the box office. Attendance dipped to around 1800 per game in an arena that sat just over 10,000 per game. After two seasons of poor attendance and rising debt, the franchise relocated to Waterloo, Iowa, for the 1969-70 season. Hockey would not return to Memphis and the Mid-South Coliseum until 1992, when the Memphis River Kings of the new CHL arrived in town. The Coliseum, placed on the list of US National Register of Historic Places, closed in 2006.